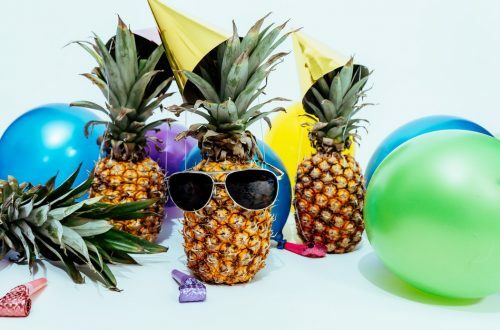 Spring is right around the corner, do you know the top 10 fashion trends of 2019? Last year everyone was raging over the color “ultra violet”. The market was saturated in all types of purple lip sticks, pants, dresses and even hair. I was one of those ultra violet band-wagoners but now, I am in full swing with this year’s spring trends. Below is 10 of Spring 2019’s hottest trends. Yet again, our safest spring fashion style is head-to-toe neutral colors. You can see models on every runway wearing all neutrals. Neutrals such as beige, ivory, taupe, black, gray and shades of white are your neutral colors however, stick to the light shades. Another reason why these colors come in hot for fall fashion is because, you can dress them up. Imagine how sharp an all beige outfit paired with a patent leather beige Louboutin pigalle follies stiletto would look. Keep it easy and classy with neutrals. “People of the world, spice up your life!” Ha, sorry! I just couldn’t resist. The ’90s are back for spring 2019, and all the butterfly details from the runways are proof of it. You can see designers such as, Naeem Khan, Zang Toi and Jasmine strutting their 90’s inspired butterfly designs down the runways. By the way, we HIGHLY approve of the 90’s butterfly swag. According to fashion, bike shorts are now a thing. Nearly every high-end designer has featured their models in a bicycle cut short. Please do not quote me on the term “Bicycle cut short” I am at a loss of words for this fashion phenomena. In other terms, the spandex shorts from the 80’s are back. Crochet textiles are becoming even more popular in recent years. You can see designers such as Michael Kors and even Oscar De La Renta selling crochet items this year. 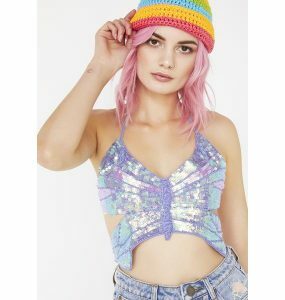 I’ve personally been a crochet artist for 25 years and I can tell you, there are no crochet machines that produce these items. Crochet is an art that can only be replicated by hand. Each crochet item takes a long time to make, that is why the cost of these items are so high. Inner hippies rejoice, bell bottoms are back, baby! 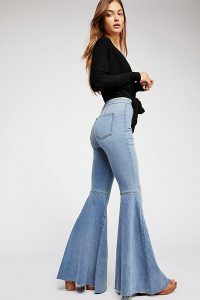 If you’ve shopped any department store lately you have definitely noticed that bell bottoms are everywhere. Stores like Macy’s, Free People, Nordstrom and Saks are sporting flares on their racks. Bell bottoms /flare cut flatter every figure. It seems like the Spice Girls reunion may be changing our fashion this year! Chunky-platform sneakers are back and kickin’. I remember having what seemed to be a 4” pair of all white platform sneakers from Soda. I believe I paid $15 for them back in the day, well today these sneakers will cost you upwards to $1,000 if you’re shopping at Balenciaga. Of course, there are tons of affordable platforms sneakers on the market. Google shopping search is your budget friendly Amiga! Color blocking is coming in hot this season. color-blocking is thought of as the process of taking colors that are opposites on the color wheel and pairing them together to make interesting and complementary color combinations. A perfect example is Red and Green Christmas sweaters. Thankfully Christmas sweater season is over, so please don’t go pairing greens and reds. Color-blocking became very popular within the fashion world in the 60’s. Almost every woman had a shift dress that had color-block patterns. Personally, I don’t think fishnets ever went out of style since the 80’s. Today you can see people like Beyoncé, Ariana Grande and Jennifer Lopez wearing rhinestone fishnets. Let’s face it, fishnets are hot and we are never going to let them go. First off, they hide stubborn cellulite 2nd,they make our legs look longer and most importantly, they make us feel like a diva. Oh no, sticky lip gloss is back. I said I would tell you the top 10 fashion trends, I didn’t say I was going to like them. See, lip gloss and I have a love-hate relationship and we’ve been on and off for at least a decade. I have long hair, which is lip glosses ultimate nemesis however, I absolutely love the shine of lip gloss. I am so over the dull over dried parched look from those matte lipsticks. So, wear those fruity lip glosses with a cute ponytail. It will save you a few shampoo washes and your sanity. “I just want to be comfortable” girls rejoice, the bulky t-shirts are back! Take this play straight from Gucci, the statement t-shirt it a top seller already. Trending is everything from bold letters, band t-shirts and bold prints. If we can see the print, you’re wearing from 75ft away, you’re on the right path. And there you have it, the top 10 fashion trends for spring 2019. What are some other trends you’re looking forward to seeing this season? Comment your fashion tips below! Can I Legally Re-purpose Designer Goods?